Mr Ben Goi’s wife, Malaysia-born former TV actress Tracy Lee (centre), walking behind the hearse as it leaves for Mandai Crematorium. 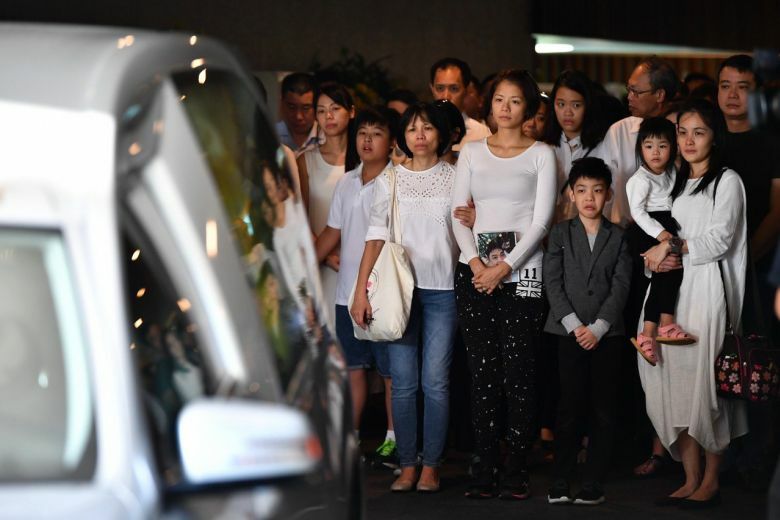 More than 100 family members and friends paid their last respects to businessman Ben Goi, son of Popiah King Sam Goi, on Thursday morning (Feb 7). 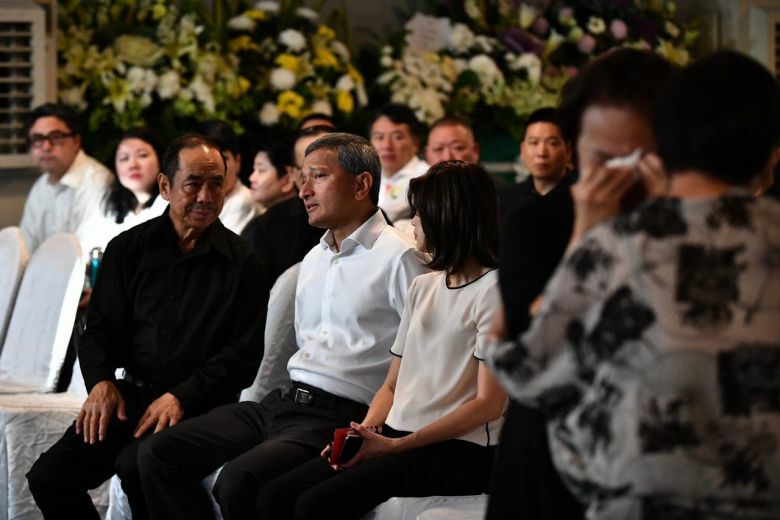 Foreign Affairs Minister Vivian Balakrishnan was among those seen speaking with Mr Sam Goi at the funeral service held on Thursday at the Bukit Timah home of Mr Ben Goi. Mr Ben Goi's casket left for Mandai Crematorium at around 9.30am. Mourners could be seen sobbing as they put their hands on his hearse and walked him out of the family's home. At the funeral service in Mandai, Mr Sam Goi said in his eulogy: "I wish that my youngest son can have a happy life in heaven as he did in life. “I must thank everyone for coming to my place and sending him off. I’m glad that so many people will think of him. He must feel very happy on his way to heaven." He also thanked politicians for coming to pay their respects over the Chinese New Year period. Mr Sam Goi's second child Laureen Goi choked up while delivering her eulogy. She said: "Meiling, (referring to Mr Goi’s wife Tracy Lee) you are part of the family, we will take care of you. We will take care of you even when Ben is not around. Mr Ben Goi’s wife, Malaysia-born former TV actress Tracy Lee, sobbed uncontrollably after placing flowers on his coffin. She later turned away from the crowd to compose herself. Mr Goi was 43 when he died in Kuala Lumpur on Sunday morning of a stroke that led to a brain haemorrhage. On Monday, ministers Heng Swee Keat, Masagos Zulkifli and Josephine Teo, as well as former foreign minister George Yeo were seen at Mr Ben Goi's wake. Singapore artists, including Terence Cao, Chew Chor Meng and Zhu Houren, were also spotted there. Mr Goi was the chief operating officer of Tee Yih Jia, a food manufacturing business which his father Sam Goi expanded from a manufacturer of popiah - or spring roll - skin into a global Asian food company. Mr Ben Goi's sister Goi Lan Ling, told Shin Min Daily News on Tuesday that he had gone to Kuala Lumpur about a week earlier, with his wife, son and maid, to visit his wife's family for Chinese New Year. They were due to return on Sunday afternoon, and Mr Goi had even video-called his family in Singapore on Saturday night, sharing pictures of Chinese New Year decorations with them. However, Mr Goi suffered from an intense headache later that night, and asked his wife to call an ambulance. After being taken to the hospital where doctors worked to save him, he died at 4am on Sunday, said Ms Goi. According to Shin Min, Mr Goi's father said that he hoped that when he woke up, he would find that it had all been a bad dream. "I have lost my beloved son, this is a pain in my heart that will never be able to heal," he said. A father of four who is in his early 70s, Mr Sam Goi was No. 14 on Forbes Singapore's 50 Richest 2018 list with an estimated fortune of US$1.8 billion (S$2.4 billion). In 2017, Mr Ben Goi married Malaysia-born former TV actress Tracy Lee in a wedding that was widely covered in the media. Ms Lee, 33, announced last May that she had given birth to their first child, a son. In a 2017 interview with local magazine 8Days, she said she met her husband through mutual friends in 2010, but the couple started dating only in 2016. Ms Goi told Shin Min that Mr Goi had been looking forward to celebrating his son's first birthday on Feb 9. After sending him off on his final journey at Mandai Crematorium on Thursday morning, Ben Goi's wife Tracy Lee broke her silence on social media. She posted a tribute to her late husband on Instagram, saying "Thank you for taking such good care of me and our baby. Let's meet in heaven one day, please give me an embrace then." The 34-year-old thanked friends and family for their love, consolation, encouragement and support during this difficult period. Lee also thanked the media for giving her family space, saying that she had been unable to respond to all their messages.